I spent the early portion of the morning photographing the area around Dream Lake after having snowshoed in on this winter day in January. The forest was covered with fog and frost and Rocky Mountain National Park was truly a winter wonderland this day. I had not intention of photographing the peaks because frankly, I did not believe the clouds and fog would part and reveal them. While I was busy composing an image of a frost covered pine tree, I stopped to take a break and enjoy the breathtaking landscape that surrounds Dream Lake. To my total surprise, I gazed up to see Flattop Mountain and Hallett Peak poking through the fog and clouds. 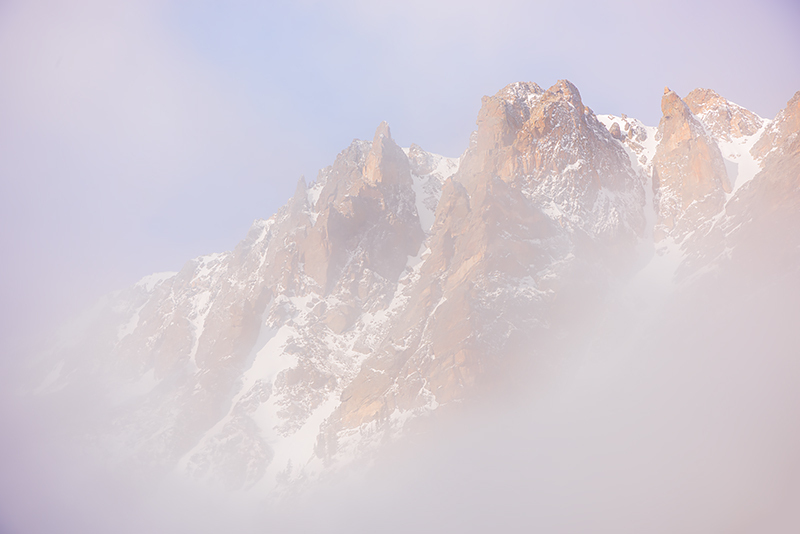 I quickly composed a few images of the scene before the fog moved back in and covered Flattop and Hallett Peak once more. Photo © copyright by Thomas Mangan.